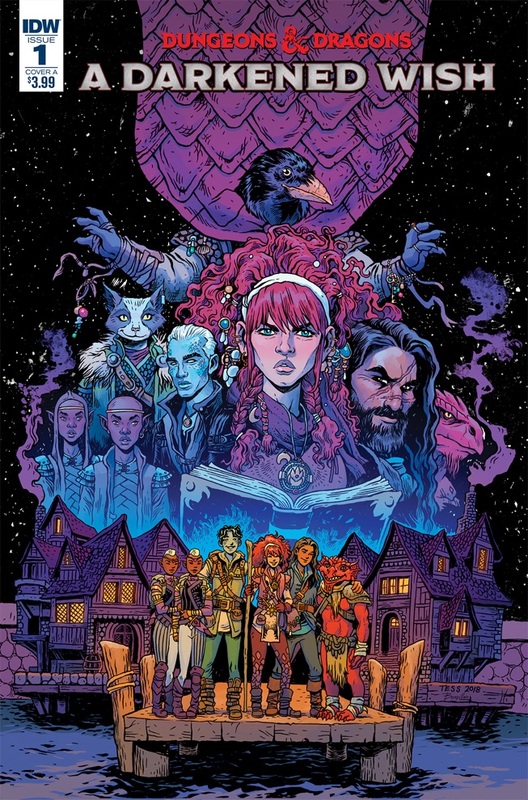 The Dungeons and Dragons franchise is as popular as ever, and with the new series from IDW, we get more from the original world building fantasy game. Let’s jump into this Dungeons and Dragon style: story first. We now journey back to the past- Helenes to be exact, on the Orland, Moonshae Isles. Packing her belongings, ready for a journey out in the world, her grandfather doing his best to convince her otherwise, but she too is insisting, talks of ascension, and serving the celestial, all things she will miss, but her grandfather understands… this is what she wants. He hands her a trinket, one she was to receives after her ascensions ceremony — a happy departing for the two. And a promise to visit soon. Night-time in a distant area in the woods, two travelers surrounded by a pack of wolves, the two joke, trying to make light of the situation the two are overwhelmed and are soon to become food for the hungry pack that is until Helene arrives to their rescue. Together they make quick work of the pack, with a few injuries added to their bodies, talking of going to Mintarn to join a White sails Company, the two decide to join her. A sense of companionship with these two, meeting more aboard their boat, meeting more of their allies, Dungeons & Dragons at its truth here. Already this series feels like a grand statement for fans of the game series. Tess Fowler was made for this series; her art style really pops here. It’s whimsical, fantastic and oh so magical… please don’t hate me. B Dave Walters gives us a world we would like to be a part of, its silly when need be, and the consequences seem real. I’m excited for more.